It is the segment of the neocortex that constitutes a part of the hippocampal formation and is involved in crucial processes of learning, memory, and neurogenesis. Dentate gyrus is composed of gray matter and makes an important part of hippocampal formation. It is tooth shaped and located between the fimbriae of the hippocampus and the parahippocampal gyrus (Snell 2010). It is located underneath the temporal lobe. The hippocampus formation consists of three elements, namely, the cornu ammonis (collectively known as the hippocampus), the dentate gyrus, and subiculum (Barrett et al. 2009; Kandel et al. 2000; Nicholls et al. 2001). The hippocampal formation forms the floor of the temporal horn of the lateral ventricle, along with other associated regions (Kandel et al. 2000). The dentate gyrus interlocks with the hippocampus, and forms a C-shaped structure, the subiculum adjoining it (Nicholls et al. 2001). The dentate gyrus consists of three layers, each of which has an assortment of cell types (Fig. 1). Superficially, there is a relatively cell-free layer known as the molecular layer. It contains dendrites of the dentate granule cells. Projections from extrinsic sources such as the entorhinal cortex, through the perforant pathway, are also observed. The middle layer is known as the granular or principal cell layer. It contains the hallmark cells of the dentate gyrus, the dentate granule cells. They are elliptical or rounded cells having spiny apical dendrites. These cells are densely arranged together without glial intervention. Unmyelinated axons known as mossy fibers extend from the granule cells. They project primarily to the CA3 pyramidal neurons. Dentate granule cells are primarily glutamatergic and therefore, excitatory in function. Dentate pyramidal basket cells are present where the granular layer transitions into the polymorphic layer. These cells are large and have a single, aspiny dendrite. They form pericellular plexus that gives its basket appearance. They are the inhibitory GABAergic interneurons. The innermost layer, known as the polymorphic layer or hilus, is composed of mossy cells. They are large, stellate or triangular cells, having dendrites that bifurcate further (Amaral et al. 2007). Information from the entorhinal cortex reaches the CA1 region through two excitatory pathways, namely, direct and indirect. The principal output route of the entorhinal cortex is known as perforant pathway. In the indirect pathway, inputs from the entorhinal cortex synapse with dentate granule cells (axons of which are known as mossy fibers). These cells further transmit information to the CA3 pyramidal neurons via the mossy fibers. 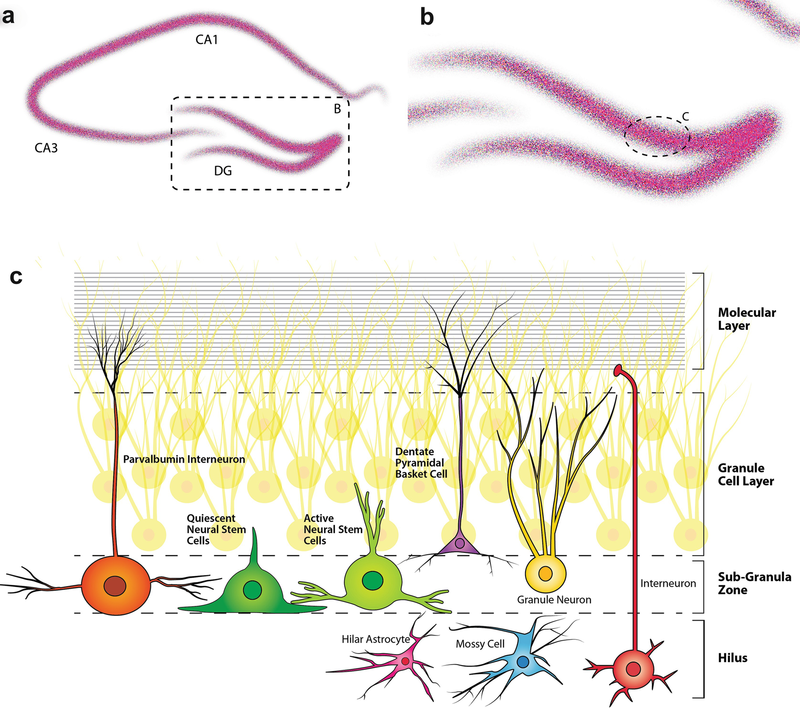 The axons of CA3 neurons (known as the Schaffer collaterals) extend to the CA1 neurons. From here, the CA1 neurons project back to entorhinal cortex completing the trisynaptic loop (Bear et al. 2007; Kandel et al. 2000). Adult neurogenesis is seen in the two regions of active proliferation, namely, the subventricular zone and the dentate gyrus (Purves et al. 2014). New granule cells within the dentate gyrus are produced from neural progenitor cells (Barker et al. 2017). These precursor cells are present in the basal aspect of the granular layer and give rise to neuroblasts. Postmitotically, these neuroblasts move apically and differentiate into inhibitory interneurons. Later on these neurons get incorporated into the local neural circuits and play a critical role in learning and memory (Purves et al. 2014). Learning and memory involves long-term changes in synaptic plasticity. Long-term potentiation (LTP) and long-term depression (LTD) has raised a lot of interest among researchers. LTP is an enduring alteration in synaptic strength succeeding a high-frequency afferent activity. In 1973, LTP was first demonstrated by Bliss and Lomo at the perforant synapses with dentate granule cells (Bear et al. 2007; Nicholls et al. 2001). They observed a consequent increase in excitatory synaptic potentials that lasted hours to days, depending on the stimulation parameters. LTP mediated by granule cells is input specific and highly dependent on NMDA receptor activity. Mechanisms that allow the reversal of LTP, for example, LTD are also displayed by the same synapses. LTD is an enduring depression in synaptic transmission. This depression could persist for days and is accompanied by an increase in calcium concentration postsynaptically (Derrick 2007). The dentate gyrus displays competitive modes of learning, specifically the homosynaptic LTP and heterosynaptic LTD (Nicholls et al. 2001). The dentate gyrus plays an important role in the efficient storage of information within the hippocampal formation. This is due to prolonged changes in neurotransmitter release, construction of new synaptic contacts, and the phenomenon of adult neurogenesis (Derrick 2007). Pattern separation is the ability to separate two closely related images, objects, spatial configuration, etc. It plays an important role in storage and recall of explicit memory. This type of memory comprises semantic (facts) and episodic memory (episodes). It has been demonstrated that there exists a correlation between pattern separation and dentate gyrus. Absence of functional NMDA receptors in the granule cells hamper in performing a pattern separation (Kandel et al. 2000). Kindling is a process wherein an electrical or chemical stimulus is amplified until a seizure occurs. This hyperexcitability induces axonal sprouting, which refers to synaptic reorganization in the mossy fibers (projections of granule cells in dentate gyrus). The vice versa is also true as studies in animals having focal seizures of hippocampal origin or after kindling show such reorganization (Kandel et al. 2000). One of the major hallmarks of temporal lobe epilepsy includes lack of mossy fiber innervation in the molecular layer (sprouting). Thus, the dentate granule cells play a pivotal role in the pathogenesis of epilepsy. It has been observed that in an ageing brain, the number of granule cells is preserved. Hence, neuronal degeneration is not responsible for cognitive decline. Axo-dendritic synapses from the entorhinal cortex to the granule cells (perforant pathways) are substantially lost. The weakening of the harmful effects of ageing is intervened by certain factors such as strengthening of preexisting connections among granule cells. Despite these compensatory alterations, granule cells are relatively more vulnerable than hippocampal cells. MRI studies show that the selective changes in the dentate gyrus can be correlated with memory decline (Chawla and Barnes 2007). Dentate gyrus is present in the higher-order vertebrates. Extensive research has been conducted on mammals to characterize the dentate gyrus. Generally, brain size and body mass vary proportionately, but some species have a higher brain to body mass ratio, for example, rodents and primates. Studies indicate that the number of granule cells present is dependent on the size of the brain. However, this correlation is not proportionate. Many differences occur even across species of the same class. Morphological and anatomical features, numbers, neural circuits, neurochemical content, etc. of the cells, are some parameters that discriminate them. Several deep convolutions of the dentate gyrus are observed in both human and monkeys. Rodents exhibit uniformity in the morphology of granule cells. In contrast, primates have varying width of granule cells, length of principal apical dendrites, and variable thickness of the molecular layer. Humans have the longest thorny excrescences of mossy cells, followed by monkeys and rodents (Seress 2007). Cetaceans (whales, dolphins) have a much smaller dentate gyrus with decreased convolutions (Hevner 2016). Dentate gyrus is a prominent component of the archicortex, which is the oldest brain system. The nonmammalian vertebrates, especially the sauropsids (reptiles and birds), have homologs of the dentate gyrus. These are the medial cortex and medial pallium in reptiles and birds, respectively. The medial cortex is very much like the mammalian cortex. Neurogenesis is observed here thus, it fulfills a role in learning and memory. It has a trilaminar organization and contains the granule neurons with several projections. They project to CA1 and dorsal cortex, unlike the mammalian dentate gyrus. The medial pallium is unilaminar and is characterized by absence of granular cells. Scientists have a divided opinion on the notion that the “avian dentate gyrus” exists where neurogenesis has been observed. It also plays an integral role in spatial learning necessary for flight and migration (Hevner 2016). Dentate gyrus is a critical region situated within the hippocampal formation. Adult neurogenesis is crucial for the proper functioning of the brain and it occurs here. It accounts for many fundamental functions such as memory formation and learning, through plasticity. Two types of synaptic plasticity – LTP and LTD are observed in the dentate gyrus. Hyperexcitability in granule cells of dentate gyrus is a core concept in the pathogenesis of epilepsy. It is a part of one of the oldest brain systems and is present in most vertebrates, if not its homolog. Evolution of the dentate gyrus is heavily dependent on the adaptations that the species acquires. It has fascinated the scientific community since time immemorial and still holds great research prospects. Many intricacies of this simple yet complex cortical structure are yet to be discovered.